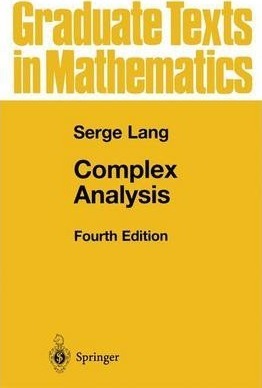 Now in its fourth edition, the first part of this book is devoted to the basic material of complex analysis, while the second covers many special topics, such as the Riemann Mapping Theorem, the gamma function, and analytic continuation. Power series methods are used more systematically than is found in other texts, and the resulting proofs often shed more light on the results than the standard proofs. While the first part is suitable for an introductory course at undergraduate level, the additional topics covered in the second part give the instructor of a gradute course a great deal of flexibility in structuring a more advanced course. Illustrations note 85 Illustrations, black and white; XIV, 489 p. 85 illus. I: BASIC THEORY. 1: Complex Numbers and Functions. 2: Power Series. 3: Cauchy's Theorem, First Part. 4: Winding Numbers and Cauchy's Theorem. 5: Applications of Cauchy's Integral Formula. 6: Calculus of Residues. 7: Conformal Mappings. 8: Harmonic Functions. II: GEOMETRIC FUNCTION THEORY. 9: Schwarz Reflection. 10: The Riemann Mapping Theorem. 11: Analytic Continuation Along Curves. III: VARIOUS ANALYTIC TOPICS. 12: Applications of the Maximum Modulus Principle and Jensen's Formula. 13: Entire and Meromorphic Functions. 14: Elliptic Functions. 15: The Gamma and Zeta Functions. 16: The Prime Number Theorem.
" The very understandable style of explanation, which is typical for this author, makes the book valuable for both students and teachers." "A highly recommendable book for a two semester course on complex analysis." "The very understandable style of explanation, which is typical for this author, makes the book valuable for both students and teachers."